Jonathan López, Nina Weber & Markus Masaites are Genesis Trio. Photo by Alexander Knopp. Rising Stars could not have been a more apt title for this month’s presentation in Roedde House’s Classical Series featuring the brand-new trio, Genesis. 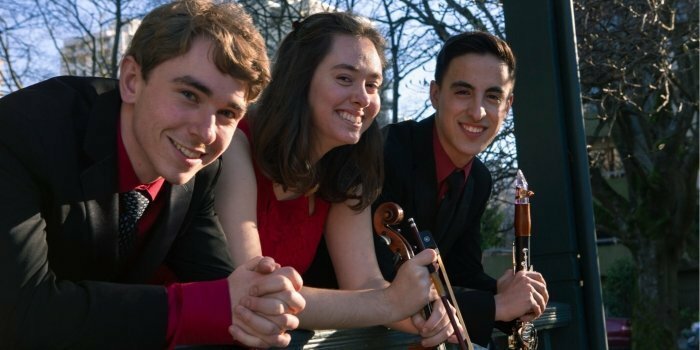 In the beginning, clarinetist Jonathan López invited two of his fellow University of British Columbia (UBC) students, violist Nina Weber and pianist Markus Masaites, to join him in making music. All three are filled with fresh ideas, youthful energy and new angles in their interpretation of old masters. So what better name to choose for their trio than Genesis? Each of them excels in an individual musical field, having performed widely in North and South America, the UK, Europe, Africa and China, as well as having won countless awards. Now as the Genesis Trio, the three are already enjoying a reputation as one of the premier chamber music ensembles at UBC. 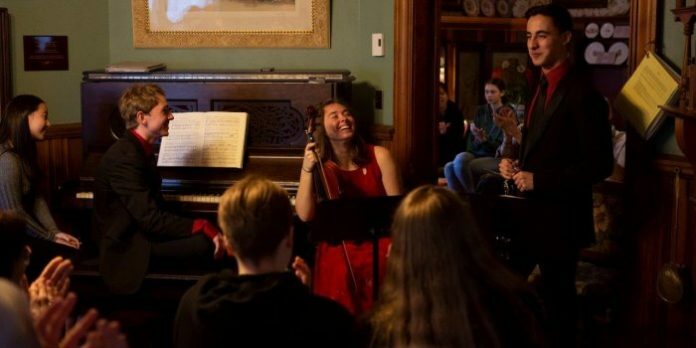 However, their first “paid gig” was at Roedde House Museum last Sunday, as part of the historic site’s classical concert series. It was a triumph. The voices of the group’s three instruments blended perfectly to make one uniquely harmonious sound that will surely earn them widespread appreciation in the future, in halls several times larger than those of the house originally inhabited by the Roedde family in Vancouver’s West End. Their good humour, wit, and clean-cut, well-dressed presentation style added to the mix. Markus Masaites (piano) Nina Weber (viola) and Jonathan López (clarinet) are the Genesis Trio. Photo by Alexander Knopp. The essence of Wolfgang Amadeus Mozart shone as brightly through their rendition of his Piano Trio, K. 498 (Kegelstatt), as did that of Ludwig van Beethoven when they played his Piano Trio No. 4, Op.11 (Gassenhauer). And their interpretations of the sixth and seventh Pieces for Clarinet, Viola and Piano, Op. 83 by Max Bruch were almost as evocative as the German composer’s famous Violin Concerto No. 1 in G minor. The Genesis Trio’s concert was so well received that classical series producer Catherine Laub publicly booked the three acclaimed musicians for a return date, on the spot. Meanwhile the trio will play on May 18 in the house concert series, My Music Friends. It is comprised of salon style concerts in houses across the Lower Mainland, though primarily at UBC. The next concert in Roedde House’s classical series, Love In Spring, featuring mezzo-soprano Martina Govednik with Roger Parton on piano and Dragana Hajduk on flute, is slated for April 14. Visit roeddehouse.org for more information. You can find more information about the Genesis Trio on their Facebook page.